You might say that Nelson County cross country and track star Kelsey Hughes got her start in distance running with a little random influence. 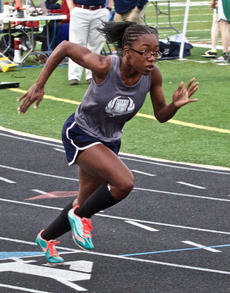 She became interested in those sports as a sixth-grader at Random Lakes Middle School in Wisconsin. 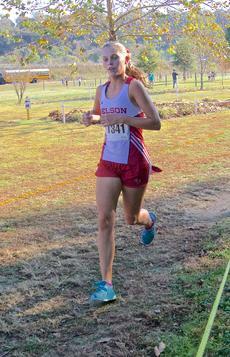 When her family moved to Kentucky, she joined the Cardinals and quickly became a standout as she qualified for the state cross country meet while in junior high. Hughes will be running for several more years as she signed last week to join the track and cross country teams at Berea College. Nelson County won its baseball opener Monday in the Ft. Walton Beach Bash in Florida, riding Benton McGill’s one-hitter to a six-inning 2-0 win over Glasgow. McGill permitted just a second-inning single and didn’t walk a batter while striking out eight Scotties. Barrett McGill drove in Cameron Lovvorn with a fifth-inning single for the Cardinals’ first run, and Dominic Lawson knocked in Andrew Morrow with a sixth-inning single. 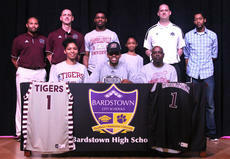 The Bardstown senior standout was rewarded for his perseverance on Wednesday when he signed to play basketball at Campbellsville University. Livers was able to juggle the rigors of playing football while keeping his basketball touch intact. “In this day and age, kids think they have to concentrate on one sport,” football coach David Clark said. “Kel knew that basketball was his favorite sport and he wanted go on and play college. But he also wanted to play other sports as well. 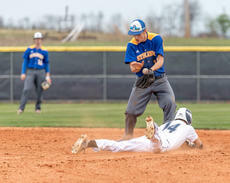 Thomas Nelson was again no match for Bethlehem Thursday as the Eagles rapped out 27 base hits and took a 2-0 lead in the three-game series with a 24-2 win. Matthew Hagan tied a state record for most hits in a game, going 6-for-6 with two doubles, scoring five runs and driving in three more. Tommy Crawford and Curtis Carrico each had four RBIs, and they were among five other Bethlehem players with at least three hits. Local high schools will be well represented this week in The Netherlands, with three area soccer players being selected for the overseas trip with Kentucky’s Olympic Development Program. “I’m just glad to be representing Kentucky,” said Bethlehem sophomore Madie Sparks, marking the second year in a row a Banshee player was selected for the team. 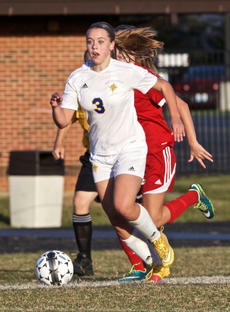 Sparks’ high-school teammate, Haley Nelson, made the trip to Holland last year. Washington County bounced back in Wednesday’s Game 2 of its three-game set with Nelson County in 19th District baseball action Wednesday, evening up the series at one game apiece with a 7-4 win. The Cardinals picked up a 3-2 home win Tuesday over the Commanders, and Thursday’s Game 3 (after press time for this edition of The Kentucky Standard) decided the series. A year ago, Thomas Nelson’s boys posted their best-ever result at the state meet, finishing 11th, tops among local schools, and gathering 23 points. Unfortunately, the two runners responsible for all 23 points are now gone. Jarrett Mattingly and Tyler Bradley are now off competing in the Ohio Valley Conference in college. That leaves some big shoes to fill, and junior Jake Humphrey, who inherits the leadership duties as the Generals’ most experienced returning distance runner, is doing his best so far.